we are happy to offer you a new great promotion: Discover our wide range of sharply reduced technology highlights on our website. Enjoy our Technology Sale with reduced prices for 1000s of products and 100s of brands in different categories. Laptops, Speakers, Power Tools, Car accessories, Cables and much more: Discover our wide range of top products at reduced prices! 1000s of technology highlights - sharply reduced! No discount code is needed for our Technology Sale. All products are available until stocks last. we are happy to offer you some great Easter Deals on our website from April 2nd to April 16th, 2017. Gaming fun, best sound and much more for Easter: Discover our wide range of top products. 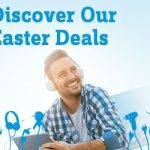 No discount code is needed for our Easter Deals. This promotion is valid until 16th April, 2017. We have already uploaded some advertising material for you! Please do not forget that we are offering an increased commission of 10% until 31st december! we hope you are well and can't wait for Christmas Eve :). or contact me via email marketing[at]conrad-electronic.co.uk. We have already uploaded some advertising material for you. In addition we are offering an increased commission of 10% to all our publishers until 31st december! or contact us via email marketing[at]conrad-electronic.co.uk.